House to house collection around the streets of Caterham, Warlingham and Whyteleafe at Christmas. Christmas Collection at Knights Garden Centre Chelsham. Taking our Pimms Tent to The Caterham Carnival & The Caterham Street Party. The 1k & 5k Bunny Fun Run in Queens Park Caterham. The Kent, Surrey & Sussex Air Ambulance Service. Delight – Caterham based charity supporting literacy for children. The start of the 2017 1K Bunny Fun Run. The Annual Easter Bunny Fun Run in Queens Park Caterham. Prostate Awareness – A 2 yearly event to raise awareness of prostate disease. Reach Out – Senior citizens lunch and entertainment programme with free transport to and from the venue. Disabled Sports day – Helping to run an all-day event. Supporting Marie Curie, St Catherine’s Hospice and Macmillan Nurses. Singing carols at care homes and the local Dene Hospital at Christmas. The purchase and installation of defibrillators in key areas of Caterham. Supporting school student’s Rotary Clubs (Interact Clubs) in local senior schools. Sponsoring Year mathematics sets for local Year 6 pupils in order to contribute to the development of their numeracy skills. Sponsoring an annual local young students sports award. Organising an annual Young Photographer competition. Supporting two local students every year for a Rotary Youth Leadership Award. Involving local schools in the Rotary worldwide campaign to eradicate polio. 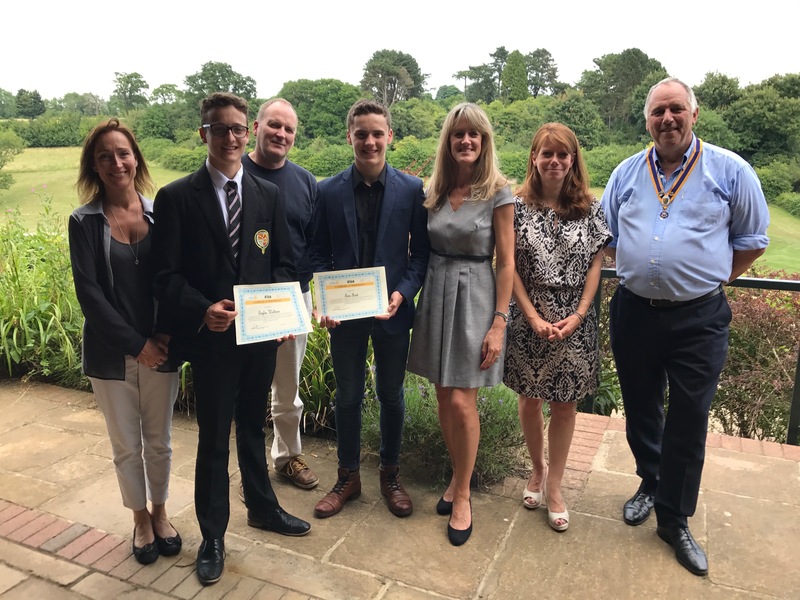 Taylor Waldron and Tom Ford from de Stafford School Caterham with their Rotary Youth Leadership Award certificates. 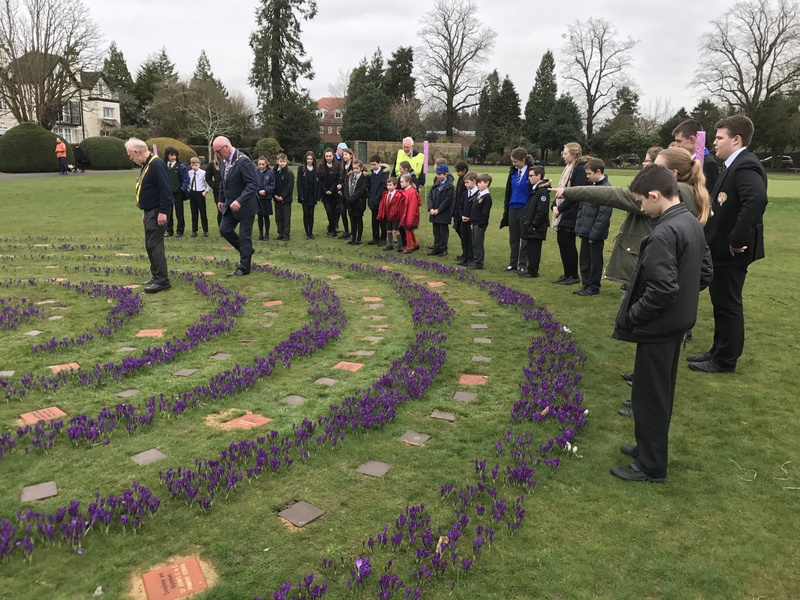 Caterham Rotary’s Purple Crocus Maze in Queens Park Caterham on the Hill dedicated to the eradication of Polio Worldwide. Supporting the eradication of Polio in Pakistan, Nigeria and Afghanistan. Provision of Shelterboxes and Aquaboxes to disaster-hit areas of the world. Annual international evening at de Stafford School featuring food and music from countries around the world. Involvement in overseas cases of need including the provision of fresh water facilities and the development of education. Our Club has a very active sports and social programme. This gives members the opportunity to enjoy each others company and to form lifelong bonds. This plays an important part when members work together on the various projects that they are involved in during the year. Visited the Magic Circle in London. Had day trips to France with our partners. Compete in Rotary competitions against other Rotary Clubs including darts, snooker, skittles and ten pin bowling. Held a summer garden sports & social event with partners. 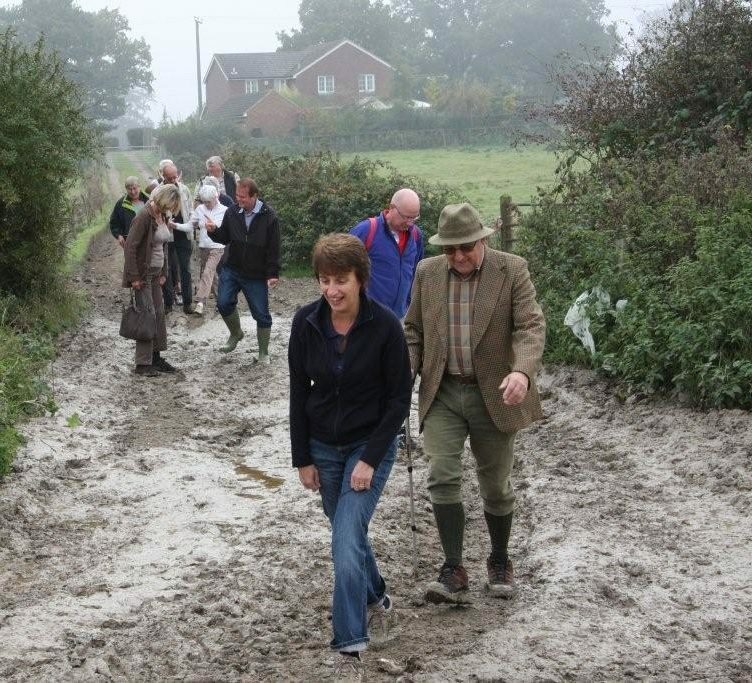 Had Sunday walks followed a pub lunch. Had guided tours of London.